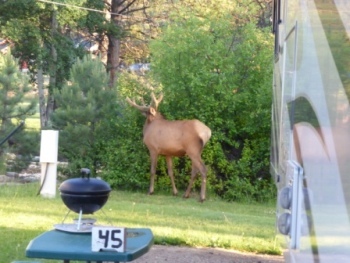 Our RV site in Estes Park. 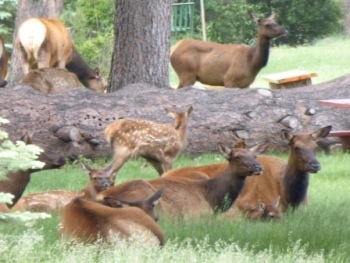 Colorado was an elk magnet. 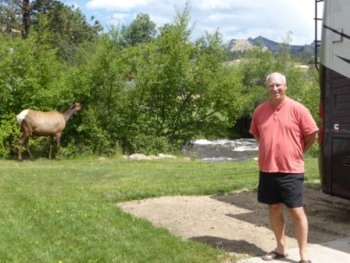 We saw an elk cow eating leaves near the stream behind our coach. 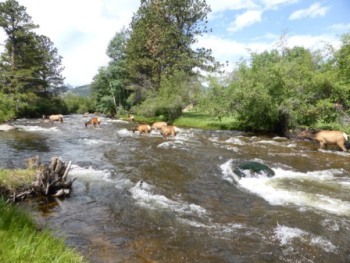 Then we saw the whole herd of about 25 cows and calves enjoying the cool water of the stream. They decided to bed down on the other side of the stream and looked at us while we looked at them. The next day we stepped out of the RV and were surprised to see a lone buck at the same bush. 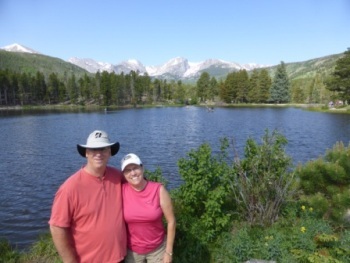 In Rocky Mountain National Park, we took a ranger-led hike around spectacular Lily Lake. 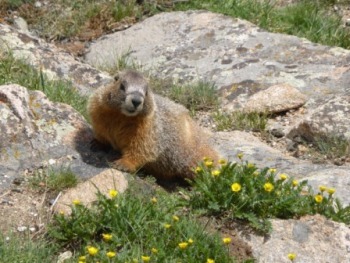 The sub alpine yellow-bellied marmots posed for pictures. 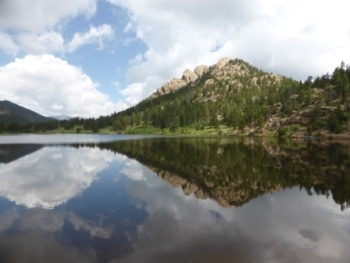 We were the only two that hiked with the ranger around Sprague Lake; and learned a lot about the geology and history of the park. 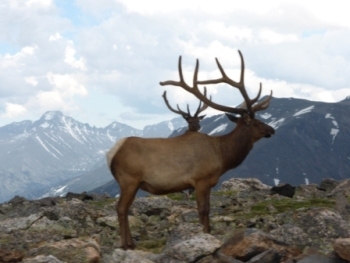 Up on Trail Ridge Road in the tundra, the elk stood near the Continental Divide. 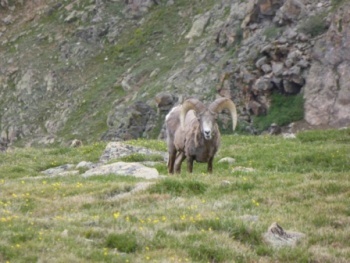 Big horn sheep also love the high tundra. 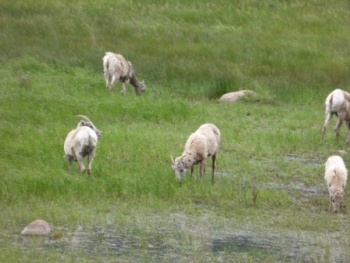 But we saw the female big horns down at Sheep Lake. 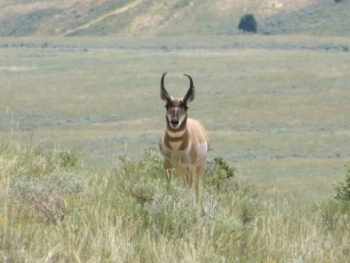 They have horns, too! 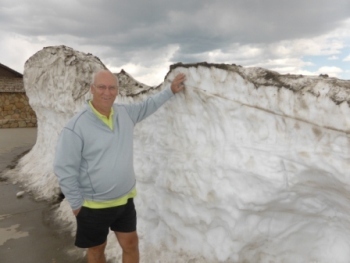 Up at the Alpine Visitor's Center, we could play in the snow; but we still had on our shorts from when we started the ascent with temperatures in the 80's. 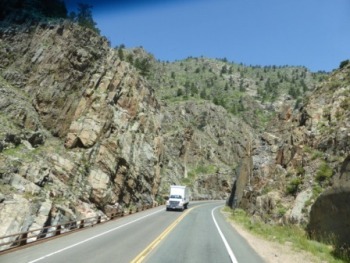 It was a joy riding in the RV going through Thompson Pass with the big views out of our front window on our way to Wyoming. 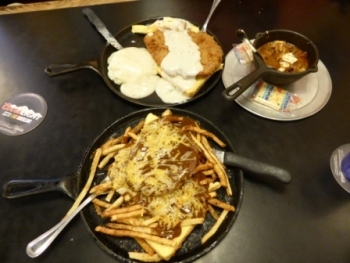 In Rawlins, Wyoming we ate a rancher's dinner at Buck's with lots of potatoes, gravy, chicken, hamburger and chili served in skillets. 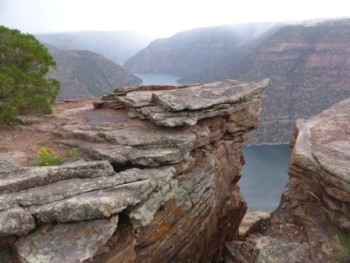 Even with rain coming in from the south, the views at the Red Canyon Visitor Center in Utah's Flaming Gorge Scenic Byway were fantastic. 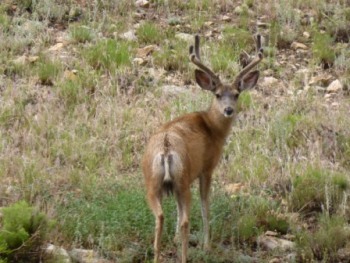 and mule deer. 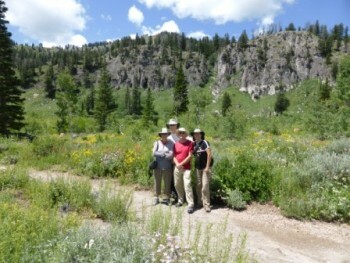 We felt like we were on "safari" as we searched the landscape for wild game. 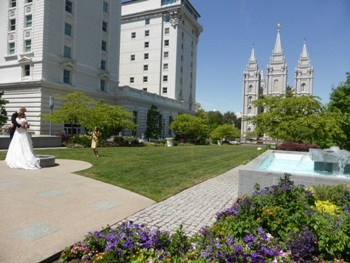 The most famous area of Salt Lake City, Utah is Temple Square - ground zero for the Morman Church. The Salt Lake Temple is a wedding place for many couples. 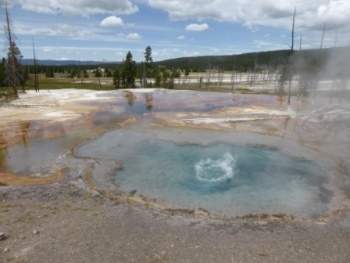 But, of course, the Morman Tabernacle Choir is what many visitors want to see and hear. Unfortunately, they are on tour and we had to miss them. 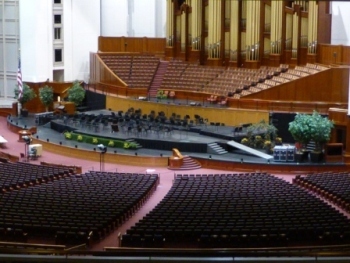 The Conference Center holds 21,000 for their annual Christmas concert. 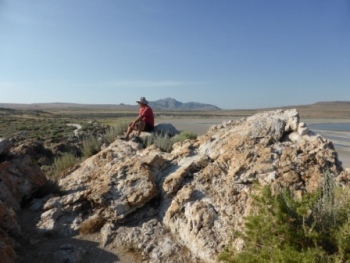 Antelope Island is surrounded by the Great Salt Lake. 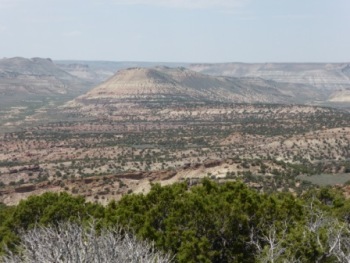 We saw lots of birds, antelope and a few bison. 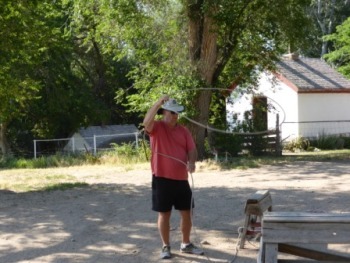 The oldest ranch home in Utah is located there and Paul showed off his cowboy skills. Near Logan, Utah we visited Tony Grove Lake with friends, Mike & Linda; where we hiked through wild flowers to our picnic site. 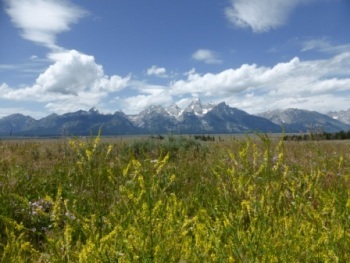 In the Antelope Flats area of Grand Teton National Park, Wyoming we actually watched antelope moving across the plains. 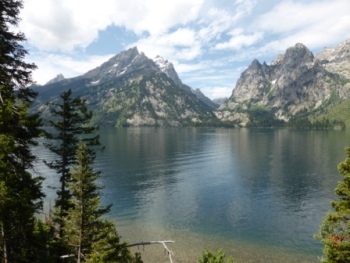 Some of the best up-close views of the Tetons are at Jenny Lake. 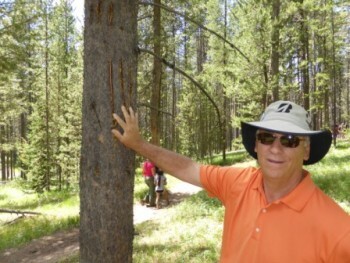 We were happy not to have an "up-close" encounter with black bears who made these scratches in the trees where we were hiking. 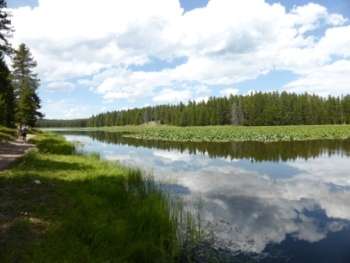 Even looking away from the mountains were huge vistas of sky and water, like here at Heron Lake. 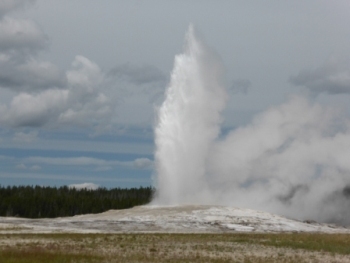 You couldn't say you'd been to Yellowstone National Park without seeing Old Faithful show off. 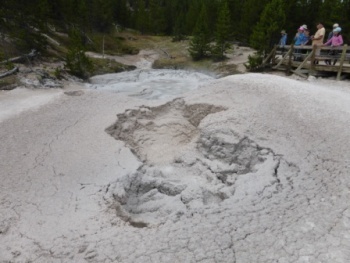 Of course, there are many areas of geothermal activity; from the clear pools at Black Sand Basin to the bubbling mudpots at Artists Paintpots. 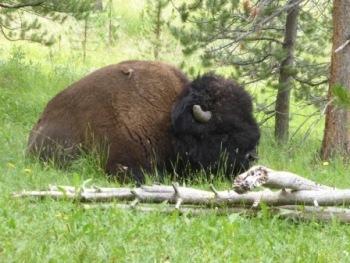 We saw several bison right next to our picnic area. 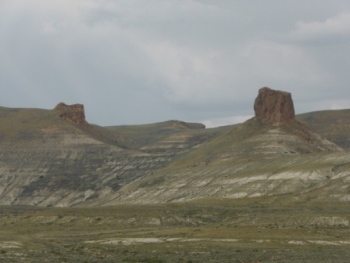 The last stop on our summer adventure was Cody, Wyoming where we enjoyed an evening of rodeo.